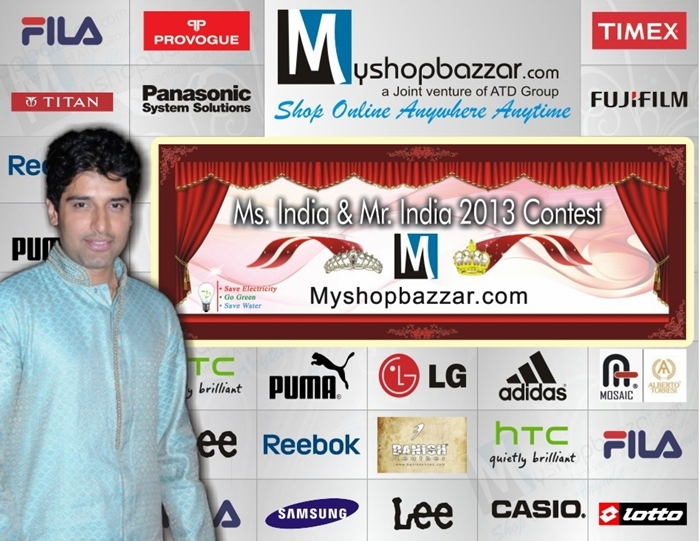 Myshopbazzar.com, a leading e-commerce player in India announces the launch of a beauty pageant “Myshopbazzar.com Ms. India and Mr. India 2013”. As its Corporate Social Responsibility, Myshopbazzar.com works for the cause of Save Electricity, Go Green (Save Plants, Save Earth) & Save Water in a move towards sustainable development of the country. This contest is a step ahead in creating awareness about these issues. Mr. Shakti Anand, a famous TV actor who has worked in famous TV serials like ‘Kyunki Saas Bhi Kabhi Bahu Thi’, ‘Crime Patrol’ and ‘Shhhh..Koi Hai’ and currently working as one of the leading actors of ‘Maharana Pratap’ has been roped in as the brand ambassador for the pageant. The most fascinating feature of this contest is that anyone living in any corner of the country can participate online in the screening stages from the comforts of their home. Also, this is probably the only beauty pageant where the age group for participation is 18-35 years. Another fascinating feature of this contest is that a person’s marital status is not a factor in the screening process. Thus, this contest is a fantastic opportunity for hidden talents across India to participate and live their dream of winning a beauty pageant. The contest consists of six stages. The first three stages consist of objective type questionnaires on topics like Current Affairs, Hollywood & Indian Film industry, IQ assessment etc. The contestants will answer these questionnaires on www.myshopbazzar.com. In the fourth stage, the participants will submit their two minute videos where they will talk about themselves. On the basis of this, 50 contestants will be shortlisted. These shortlisted 50 candidates will then move on to the penultimate 5th stage which will consist of a subjective type questionnaire where 10 questions on different topics will be put to the contestants and they will be required to provide answers in 500 words. At the end of this stage, 10 candidates for Ms. India title and 10 candidates for Mr. India title will be shortlisted based on the points that each candidate scores in this stage. The final 20 candidates shortlisted by the jury and Myshopbazzar.com will then be called for the mega event which is to be held on 19th October, 2013 at Siri Fort Auditorium, New Delhi. The finalists will be required to participate in various activities like Group Discussion, Fashion Show, Dance Performance, Question-Answer session with the jury etc. Jury members will award points to the contestants for each activity. Apart from Ms. India and Mr. India titles, twelve other sub-titles would also be awarded.